Debt.com assists consumers in locating BBB accredited debt relief companies that offer a variety of services, including bankruptcy, credit card debt, credit monitoring, credit report errors, identity theft, loans, student loans debt, tax debt, and more. Since 2006, Debt.com has assisted consumers in settling or negotiating their debt. This service was founded by financial services professionals with years of experience in the debt relief industry. While Debt.com does not directly provide debt relief services, they locate BBB registered companies and match you with qualified companies who can help you with a variety of financial solutions, including bankruptcy, credit card debt, credit monitoring, credit report errors, identity theft, loans, student loans debt, tax debt, and more. Debt.com provides a no-obligation 100% free consultation to help you compare the top rated debt solutions for your specific financial situation. Ultimately, you have the freedom to decide whether or not you want to follow through with any of the companies you are matched with from Debt.com. Accredited service: Debt.com has an A+ from the BBB and connects you with BBB accredited services. Free initial consultation: Debt.com provides a free initial, no obligation consultation. This debt relief analysis and estimated savings will not affect your credit. Additional resources: They provide extra resources such as a debt calculator and an educational blog. 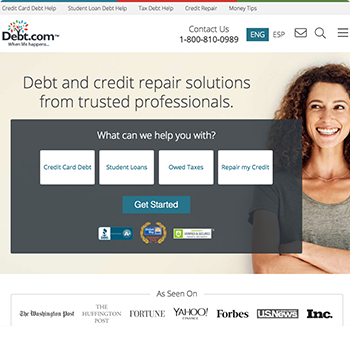 There is not much information on Debt.com's website about the companies they are partnered with. Potential customers are urged to undergo a free consultation to learn more. Pricing varies greatly on the program you are enrolled in and fees are subject to change. Debt consolidation programs may charge a one-time enrollment fee of $25 to $75 for debt relief proposals submitted to creditors. Depending on your state of residence and number of creditors enrolled in the program, monthly program administration fees range from $5 to $75. What are the minimum requirements to qualify for Debt.com? Because Debt.com connects you with debt relief companies, the requirements to enroll vary depending on the service. A debt management program allows you to pay off what is owed in a manageable way, by paying a lower interest rate to quickly rid yourself of debt. A debt settlement program settles your debt for less than the full amount you owe; however, even though this closes the account, you will see a 7-year credit report penalty for all settled debts. What are some potential downfalls of enrolling in a debt settlement program? In general, debt relief services can negatively affect your credit and may result in legal action from creditors for unpaid accounts. Some consumers are also unable to complete debt relief programs for many reasons such as insufficient funds. Debt.com's address is 5769 W. Sunrise Blvd, Plantation, FL 33313.